Thanks a lot for sharing this project. In December '09 I built one myself as a present to Christmas for my little nephew who is eight months old. He loves watching the light and colour changing very much. However for some reason the code doesn't seem to be working to me as I expected. When switched on, or power is connected everything works fine. Although whenever the "change mode" button is being pressed the system comes to a state where only the red LED (in my case) is emitting just a very little but, so one can barely sense it. It remains in this state even when the button is pressed again and again. Is this a problem you may have noticed by chance as well and know a workaround? I already took a few hours to understand the code to solve this. But I am afraid my skills in the C programming language are not sufficient yet. I'll see if I can reproduce or diagnose your problem tonight (GMT+10) and get back to you. The only thing I can think of right now is to check that you haven't confused the Change and Sleep pins. I just breadboarded up this circuit, and I see the same thing you do, and also on the pictured prototype circuit (which did not include switches). It looks like something weird is happening in interrupt vectoring. A low pulse on pin5 (PB0) appears to triggering the change handler, and pin6 (PB1) is triggering the OFF handler, which is the opposite of what is intended. Try moving your change switch to pin 5. Hope your finger will get well again soon! Yeah, thank you so much for sharing this and all the information, including code, that goes with it. I'm also glad you sprinkled in some humor, as the technical jargon and acronyms, albeit necessary, cause a little mental indigestion. How would one proceed if one had a common-cathode rgb led? 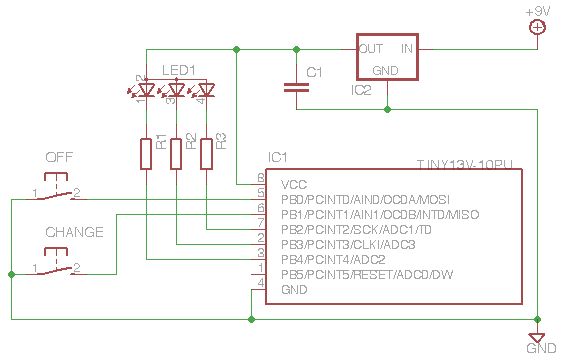 how much would the schematic change and the software? could you give me some tips for this? 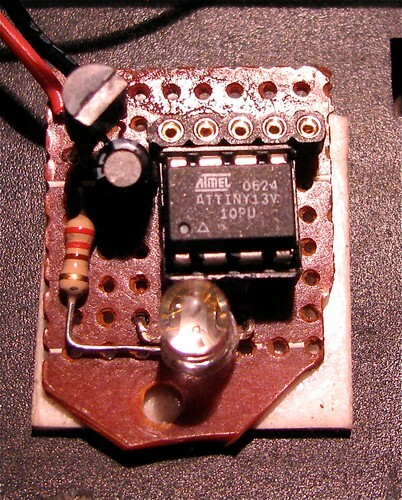 @jimday, you can just wire the common cathode to ground instead of 5v. The code will work as is, but the colours will differ. To restore the original same behaviour with a CC led, there are four lines in the code that are of the form either "PWM_PORT |= mask" or "PWM_PORT &= ~mask". Change '|=' to '&= ~' in each place and vice versa. Making an option for this is something I always intended to add, I'll try to push that up soon.